Honduras currency is called lempiras. Honduran money is not that difficult. Let's take the unknown out of the Honduras money equation right now so that you can better enjoy your vacation. • Banks – Buy your Honduras money (lempiras) and cash your travelers checks (buy American Express at home) at banks. When you arrive in Honduras, San Pedro Sula and Tegus airports have exchange cages. Buy enough lemps to hold you until the next day, when you can visit the bank. Hotels and shops are going to charge you hefty commissions to exchange for Honduras currency. It makes no sense to stand on the curb with a money-changer (quite legal), flashing 3,500L (lempiras) in Honduras money. If you see a bank without a line, jump in it while you can and buy your Honduras money. Banks are slow, but safe. Major cities offer full banking services if you have a command of Spanish and a lot of time. Take US $s to Honduras. I didn't see a Canadian $ or a Euro once in Honduras (visitors tell me that this remains current advice, May 2004). • Cash – Use good judgment on handling Honduras money. If traveling with another person, each person should carry half of the traveler’s checks and half of the currency. ◊ Make sure you have plenty of currency in 100- and 200-lempira notes. The 500-lempira note (~$26.00) if often difficult to cash. ◊ Have sufficient smaller notes (1, 2, 5, 10, and 20’s for buses, tips, etc.). ◊ Take along a pocket calculator and leave it a school when your trip is complete. It will come in handy when your hotel bill runs 2451 lempiras and you need to know how much that is! • Lempiras and Dollars - Many of the shops and restaurants on the Bay Islands will accept dollars as Honduras currency in addition to lempiras. Always ask in advance. Lempiras are 'cash du jour' on the mainland, the only currency you will see. 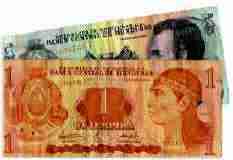 • Exchange rates - Honduras money and exchange rates fluctuate daily between the lempira and the dollar. Overall, the lempira has taken a beating against the US dollar (because of commodity prices and fiscal policy) in the last year. Numerous sites exist to help you with current exchange rates for all currencies, to include US $s, Canadian $s, and the Euro. • Best site for exchange rate: Oanda, mainly because I can print and clip a nice, small cheat-sheet (about the size of a credit card) that I can throw in my wallet before I leave. • Cash belts – Buy one at any luggage store. Keep your passport and extra Honduras currency and loose cash in it. Put the day’s anticipated money needs in your front pocket. Nothing more. • ATM’s – Some have reported problems with ATMs. (Jul 2004) -- A Siguatepeque resident states that the machines function without problems in Tegus, San Pedro Sula, and Siguatepeque. On occasion, there is no cash available. Those with recent experience are encouraged to so that the information here remains current. Thanks. If you are insistent on using that ATM, you can locate them for VISA and MasterCard, by city. • Tipping – Some books will encourage you to keep tipping to a minimum in Honduras and Latin America. Implicit in that suggestion is “you don’t need to ruin it for the next North American that visits after you.” Well, I choose to tip with Honduras money (dollars, while stronger, may be inconvenient for the recipient although you won't find anyone turning them away). When to tip and how much? (Again, this is on the heavy side, I know). ◊ First, check your bill. Often, there is a 10% added in. ◊ I generally tip 15%, depending on the service at meals. ◊ I leave 2% of the cost of an evening’s lodging on the dresser for the maid (local Honduras currency). Overdoing it? I don’t know but the small amount means 3-4 pounds of beans, rice, or corn for the home of the person who is serving you. ◊ Bellhops can be invaluable allies. I tip (again, with Honduras currency) them early in a visit, posing questions before they slip out of the room. If he (and they are all he's) has a good feel for the city, find out what days and times he works. The information they can share is worth the money. If I go out early for coffee and pastries (pasteles), I buy some sweets from the bakery (panaderia) to share with the night staff and bellhops. • Prices - Traveling in Honduras is as inexpensive as it gets. Your Honduras money goes a long, long way. Utila and Roatan are among the cheapest places in the world to become PADI certified in diving. Food and hotels are extremely good values for your money. Prices double from the mainland as soon as you step off the plane on Guanaja, Roatan, or Utila. • Open-air markets (Mercados) – Markets are wonderful places to shop, but as well, are fantastic places to people-watch. Every town, regardless of size, has a market. Hondurans, like all Central Americans, shop daily for their needs. You can find everything from coffee to nutmeg; used tires to machetes. ◊ Many North Americans haggle over prices in the markets. I don’t. Not my style. You decide for yourself. I remember watching a European woman bark at a young Guatemalan girl in a shop on Roatan, all to reduce a price by 12 cents. ◊ If the price is outrageous, merely turn away. If the merchant wants your business, the price will drop to an appropriate amount. 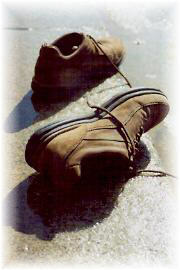 • Department Stores – If you arrive in Honduras and go “whoops, I should have brought ___________,” not to worry. There are modern, well-stocked department stores in San Pedro Sula (three malls - see note below), Tegucigalpa (one mall), and La Ceiba. I had no trouble finding some needed clothing in La Ceiba’s department stores at very reasonable prices. Note: "City Mall" opened in November 2005 in San Pedro Sula and boasts of 225 shops as well as 8 movie theaters, 7 banks, 24 fast-food restaurants and 4 standard restaurants. • Music - When you are in the larger cities, stop in a music store. Grab one of Guillermo Anderson's tapes. Anderson is the pop singer in Honduras. We particularly like his Pobre Marinero but they are all good. If you forget to stop, you can always order them from home. I have used this site and received the CD's in a very timely manner. ◊ Coffee – anywhere but I am particular to the coffee in Copan and Santa Rosa de Copan. Keep your eyes open elsewhere for a $2.50/pound variety. In another section, I more fully discuss Honduras coffee. ◊ Real estate prices are only going to go up on Roatan. The island is on the verge of being 'discovered.' The 'secret' is out. Cruise lines are now docking weekly in Coxen Hole; sailing ships from Playa del Carmen moor every week in West Bay. All these new visitors take note of the same thing you do -- gorgeous beaches and reefs, a welcoming people, reasonable real estate prices without any taxes to speak of, a wonderful climate, a low cost of living. 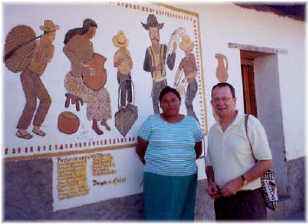 • Buy a Purse - Years ago, I saw the old men of rural Guatemala carrying woven purses (called bolsa or bolso de bolsillo). I bought one and have been liberated ever since. What an ingenious idea! Sunglasses, toilet paper, travel book, notebook, pen, comb, Imodium, etc. all in one place! You can buy a bolsa in any open air-market. Now, if I could make that step in North America.